Amyotrophic lateral sclerosis (ALS) is a fatal neurodegenerative disease, characterized by progressive motor neuron degeneration, muscle weakness, paralysis, and ultimately death within a short period after diagnosis. The pathogenesis of ALS is mediated by diverse cellular pathways such as oxidative stress, mitochondrial dysfunction, excitotoxicity, and neuroinflammation. Advancement in genetic discoveries in ALS emphasizes that ALS is a syndrome rather than a single disorder. 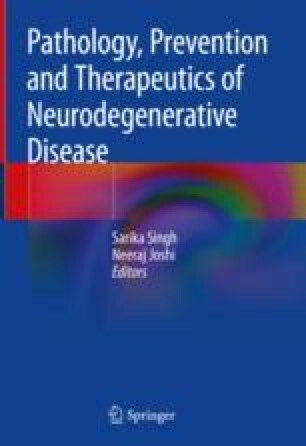 It is therefore utmost needed to better understand the underlying disease mechanism and etiology and search for neuroprotective agents that might delay disease onset and progression, extends survival, and ultimately reduces the burden of disease. In this chapter, we focus on studies of various small pharmacological compounds targeting the proposed pathogenic mechanisms of ALS and discuss their impact on disease progression. Furthermore, we also summarize the progress in the non-pharmacological therapy trials in ALS. Currently, no therapeutic effort seems to be successful, but recent findings in ALS will certainly help in the discovery of an effective treatment. V.K. thanks the Department of Science of Technology, India for the award of DST-Fast track fellowship (SB/YS/LS-161/2014). M.I.H. thanks the Department of Science of Technology and Council of Scientific and Industrial Research (India) for financial support. Ganai SA. Small-molecule modulation of HDAC6 activity: the propitious therapeutic strategy to vanquish neurodegenerative disorders. Curr Med Chem. 2017;24(37):4104–20. https://doi.org/10.2174/0929867324666170209104030. CMC-EPUB-81646 [pii]. Takahashi K, Yamanaka S. Induction of pluripotent stem cells from mouse embryonic and adult fibroblast cultures by defined factors. Cell. 2006, 126(4):663–76. https://doi.org/10.1016/j.Cell2006.07.024. S0092-8674(06)00976-7 [pii].